A “behind the scenes” look at Atlanta’s best internal and external communication tools and services! Join us for a libation, a snack and learn how Porter Novelli, J.M. Huber Corporation, Verifone, Piedmont Healthcare, Macquarium, and others are bringing technology innovations to the front line of internal and external communications. The registration fee includes one drink (includes cocktails) and valet parking is included. 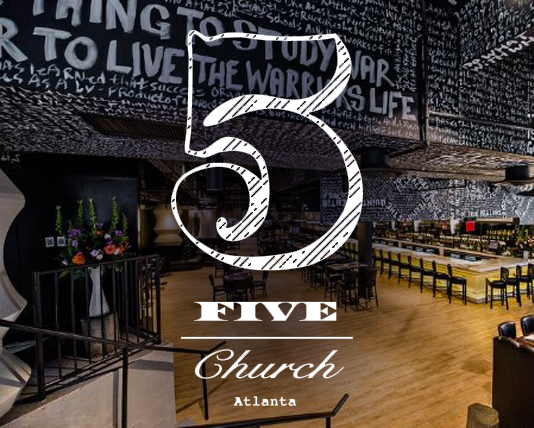 This year’s event will be held at 5Church in the heart of downtown Atlanta. An outpost of a Charlotte original, this chic Midtown New American is decked out with swanky black leather and head-turning artwork. The creative seasonal menu spans snacks to steaks, and there’s a buzzy weekend brunch and a full bar crafting creative cocktails. At J.M. Huber Corporation, we’re improving today for a better tomorrow. Combining imagination, inspiration and innovation, we enhance the performance of thousands of consumer and industrial products around the world. Over the past 135 years we have grown and evolved to continually meet the changing needs of our customers, with a focus on the long-term. Our portfolio of companies hold leadership positions in industries ranging from personal care products to food and beverage, flame retardants and smoke suppressants, sustainable forestry and engineered wood products. The J.M. Huber Corporation’s website was out of date, clunky and difficult to update. Using an opportunity to update the website to refresh the company’s brand positioning, the Corporate Communications team built an innovative, dynamic new website on a WordPress based platform that has had an immediate impact on the company’s ability to promote its culture and key corporate initiatives. This has already increased the speed to hire in several executive job positions, and garnered immediately positive feedback from the family owners, employees and other external stakeholders. Macquarium is a digital agency and customer experience focused application development company based in Atlanta. We are a team of thinkers, dreamers, and doers united by a deep passion for creating transformative customer experiences. We began our journey 27 years ago by ushering iconic brands into the digital age. Today, we continue our mission of helping our clients harness the power of digital experiences to drive both business and customer success. Our award-winning portfolio includes a broad range of digital marketing, branding, research, strategy, web, mobile, eCommerce and workforce enablement projects including our recent and ground breaking work with voice and smart speakers. Piedmont is an integrated, not-for-profit healthcare system of 11 hospitals, 24 urgent care centers, 28 Piedmont QuickCare health retail clinics at Walgreens, 555 physician offices and 1,800 Piedmont Clinic members across greater Atlanta and North Georgia. We are more than 22,000 healthcare professionals committed to Piedmont’s purpose – to make a positive difference in every life we touch. Last year, Piedmont launched a new intranet to improve user experience and briefly introduced Ludwig, an online assistant named after one of Piedmont’s founders. At launch, Ludwig hosted an online Q&A forum and (passively) recommended items of interest when employees read content. This summer, Ludwig received his own profile and started climbing the ranks as an online influencer who speaks on behalf of the organization. Porter Novelli is a global public relations agency built on a rich heritage of marketing for social good. We’ve been motivating people to change deeply ingrained behaviors rooted in cultural and social norms for more than 25 years. Our client needed a tool that makes tracking developmental milestones easy for parents and empowers them to act early if their child displays signs of developmental delay. Porter Novelli developed the Milestone Tracker app, incorporating vital features missing from other materials in order to best meet parents’ needs in an interactive format. The app features: milestone checklists; descriptive photos and videos; activities to support early development; tips for taking action when there are concerns; and reminders for appointments/screening. Verifone is transforming every day transactions into new and engaging opportunities for merchants and consumers at the last inch of payments and commerce. Powered by a growing footprint of more than 30 million devices in more than 150 countries, our people are trusted experts working with the world’s best-known retail brands, financial institutions, and payment providers. Verifone is connecting more products to an integrated solutions platform to better meet the evolving needs of our clients and partners. Built on a 37-year history of uncompromised security, we are committed to consistently solving the most complex payment challenges. Verifone will demonstrate how they’ve produced a successful – and low budget – Tech Talk podcast series for employees, in which we highlight our most innovative technical leaders within the company.